It has been a long time since I've posted here. Sorry about that, but I've mostly been busy writing code on the site and the Android app. Recently you might have noticed some substantial speed improvements on the site, as well as bug fixes and interface improvements. I'm also currently working on a tagging system and some other ways to make it easier to browse and discover lectures. But what I really want to talk about today is the Android app. After months of work, I'm happy to announce that the Android app for Lernabit is now in open alpha phase! The Android app does all of the things you can do on the website. As with most mobile apps, it responds more quickly than the website and has a shorter startup time. But I didn't just want the app to be a mobile version of the website, because the website is already designed to work on any screen size. Mobile apps have a lot of potential to leverage some of the exciting hardware on phones to do things a web browser can't. Specifically, the real benefit of a mobile app for Lernabit is that the phone has a built in microphone, which makes it much easier for anyone to create their own lectures. As such, this feature is the major focus of the app right now. I built it using what I've learned from experience creating a lot of lectures myself. 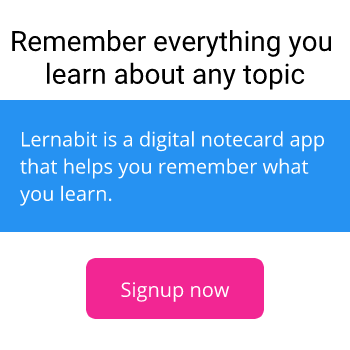 You can use the app to record your own lectures and upload them to Lernabit. But I didn't stop there. The app is designed to work side-by-side with the website as one unified publishing tool. When creating lectures, I personally find it helpful to have notes available while recording the audio. You can actually do that with the app. You can open the website on your computer and write your notes directly into the publisher, then use the app on your phone to record the lecture while reading the notes on your computer. When you are done, just submit both of them and they will be paired up automatically. Pretty cool! For anyone who might not know, Alpha Phase-- or Alpha testing-- is a phase of software development when the software is built, but is still far from perfect. As far as the Lernabit app is concerned, it is done, and it can be downloaded and used, but there might still be some bugs. But as long as you have it installed, you will continue to get bug fixes delivered through the Google Play store as those updates become available. Celebrating 1 year since the relaunch of Lernabit. It has been a while since I last posted here on the blog, so I thought I would write about some of the stuff I've been working on lately.